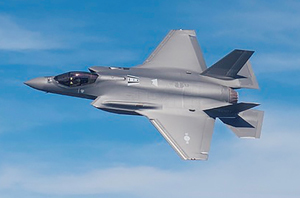 A consortium of Korean defense companies has been selected to handle Asia-wide repairs for the U.S. F-35 stealth fighter, the Defense Acquisition Program Administration said Tuesday. The consortium consists of Hanwha Systems, Korean Air and LIG Nex1 and three others, which will handle repairs in three out of 17 areas -- avionics, electronics and ejection system -- from 2025 to 2040. Korea, Japan and Australia operate F-35 stealth fighters in the region. Korea plans to buy 40 F-35 jets from March of this year until 2021.